Background & objectives: Cutaneous leishmaniasis displays two epidemiological routes of transmission, zoonotic cutaneous leishmaniasis (ZCL) which includes animal reservoir hosts in the transmission cycle and anthroponotic cutaneous leishmaniasis (ACL), where human is the sole source of infection for the vector sandflies. About 10–13% of CL cases are reported each year from Adana province in Turkey. The aim of this study was to develop a predictive model for determining the spatial risk level of cutaneous leishmaniasis in the Adana province, southern part of Turkey, in relation to environmental factors. Methods: Entomological survey was carried out between June 2015 and September 2016. Sandflies were collected from Karaisali district of the Adana province using light-traps and sticky papers. Sandfly fauna results were compared with environmental data obtained from field-survey, and examined with univariate and binary logistic regression in PASW statistical software. The ArcMap application of ArcGIS10.0. software was used for geographical adjustments to create maps and establish a risk model. Results: In total five sandfly species were identified in the study area, and three of them (Phlebotomus tobbi, P. neglectus/syriacus and P. perfiliewi) were detected as potential vectors of cutaneous leishmaniasis. The results showed that enhanced vegetation index (EVI) and emissivity band 31 (EMIS31) values are related to the distribution of these three species. Interpretation & conclusion: The created risk maps may provide useful information to guide the control programme interventions and prevent the economic loses in the future insecticide applications. They could be used to better understand the distribution of vectors, and determine the epidemiology and risk level of the CL. Sandflies are bloodsucking nematoceran Diptera, which transmit protozoan parasites of the genus Leishmania to humans. There are >800 sandfly species in the world. Approximately only 30 of 800 species are recognized as proven leishmaniasis vectors in the world,. Twenty-nine species or subspecies raised to species level belonging to the Phlebotomus and Sergentomyia genera have recently been reported in Anatolia region, Turkey; with 18 of 29 known as proven or probable vectors of human leishmaniasis in the Old World,,,,,. Leishmaniasis is one of the important vectorborne diseases, that range over the subtropical zones of America and Africa and extend into the temperate regions of South America, Southern Europe and Asia. Two clinical types of leishmaniasis, zoonotic visceral leishmaniasis (ZVL) caused by Leishmania infantum, and anthroponotic cutaneous leishmaniasis (ACL) caused by L. tropica and L. infantum have been reported in Turkey. The ZVL is endemic in the Aegean, Mediterranean, and Central Anatolia regions and has been found sporadically in other regions. The ACL is characteristically present in the southeastern and eastern Mediterranean regions, and has been spreading to other regions due to different risk factors such as presence of vector species, temperature, humidity, etc,. The study area, i.e. Karaisali district is located in Adana province, which has favourable ecological environment for spread of sandfly vector population, and presence of the susceptible human population for Leishmania transmission. In this study, the environmental factors that appear to predict the presence or absence of sandfly species and disease risk were identified,,. These factors have been reported to trigger the emergence of cutaneous leishmaniasis in the area, since a total of 172 CL patients were reported between the year 2008 and 2016 in Karaisali. Geographic information system (GIS) technologies are useful applications for capturing, storing, manipulating, analyzing, managing, and presenting all types of spatial and environmental data that are associated with them. The GIS can establish a fundamental tool for studying the epidemiology of various diseases. These tools can be used for identifying the locations of patients, mapping the disease and illustrating up the spatio-temporal relationships among patients and certain features such as incidence, prevalence and evaluation of cutaneous leishmaniasis epidemiology. Integration of GIS tools and disease data collated from various sources, and their efficient manipulation could help in predicting the disease spread, its revival and mapping etc. Recent GIS technologies offers some useful applications to analyze the relationship between several geographical and environmental data along with the conventional techniques that were carried out primarily by drawing maps to obtain the desired results. 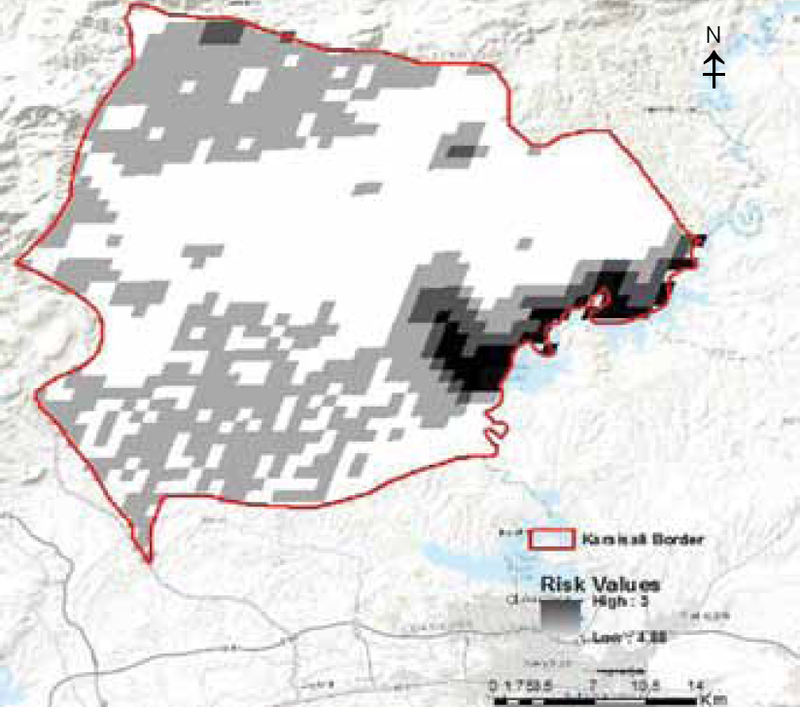 The aim of this study was to generate a novel predictive model for determining the spatial risk level of cutaneous leishmaniasis in relation to environmental factors in the Karaisali district, southern part of Turkey. The study area, i.e. Karaisali district is located in Adana province of Turkey. It spans in an area of 1.526 km2. The mountain range of Taurus is located in the northern part of the study area and constitutes the border between Karaisali and the inner Anatolian region of Turkey [Figure 1]. The average temperature of Adana province during 1950 to 2014 was 17.5°C (Max 23.5; Min 12.1°C). The annual average rainfall during these years was 688.2 mm16. The major reason for selecting this area was the dominancy of proven leishmaniasis vector P. tobbi in Karaisali and Adana, which is considered as an endemic area for cutaneous leishmaniasis caused by L. infantum. The entomological survey was carried out twice, i.e. between 22 and 28 July, 2015; and between 5 and 8 September 2016. 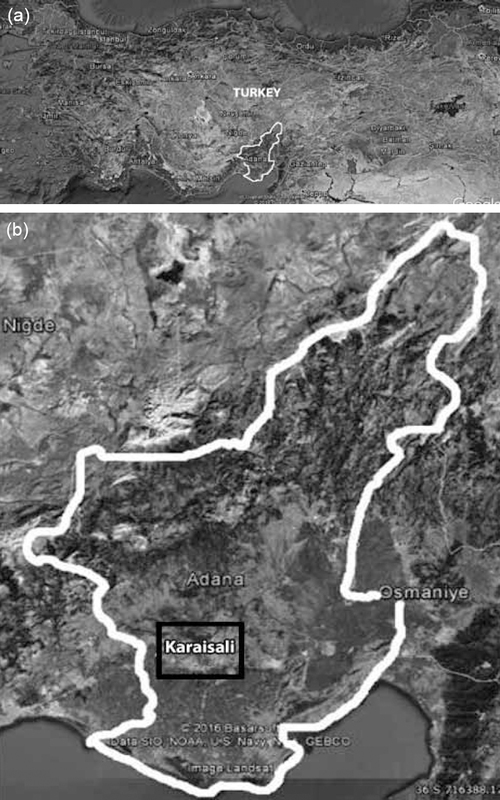 Figure 1: Location of (a) Adana province in Turkey; and (b) Karaisali district (Study area). In the study area, a total of 136 light-traps were set up [Figure 2]. Sandflies were collected using these light-traps in July and September in 2015 and 2016 respectively. During the survey, 10–20 sticky paper (A4 type) traps were placed on the walls, for trapping the sandflies in their resting time to maximize the catch. Figure 2: The location of the light-traps in the study area. In the study, the datasets obtained were separated into two main categories (MODIS and non-MODIS). The environmental data corresponding to the coordinates of each location where sandfly samples were extracted from topographical and remotely sensed images. Data on elevation, slope, and aspect of the study area were derived from three arc-seconds resolution Shuttle Radar Topography Mission (SRTM) payload. The SRTM radar contained two types of antenna panels, C-band and X-band. The near-global topographic maps of earth called Digital Elevation Models (DEMs) are generated from the C-band radar data. The normalized difference vegetation index (NDVI), enhanced vegetation index (EVI) and land surface temperature (LST) were obtained from Landsat 7-enhanced thematic mapper (ETM) + sensor (path 175, row 34) and moderate resolution imaging spectroradiometer sensor (MODIS) data set. For MODIS data, temperature layers were extracted from MOD11A2 and reflectance layers were extracted from MOD13Q1 files. The MOD11A2 version six product provides an average, 8-day, per-pixel LST data [day- and night-surface temperature bands (31 and 32 emissivity)] in a 1200×1200 km grid. The MOD13Q1 version six product provides a vegetation index (VI) value on a pixel basis. There are two primary vegetation layers. The first one is the NDVI, which is referred to as the continuity index to the existing National Oceanic and Atmospheric Administration-Advanced Very High Resolution Radiometer (NOAA-AVHRR). The second vegetation layer was the EVI, which improved sensitivity over high biomass regions. Along with the vegetation layers, there were also MODIS reflectance bands 1 (Red), 2 [Near Infrared (NIR)], 3 (Blue), and 7 [Mid Infrared (MIR)], as well as four observation layers. MOD13Q1 imagery includes 16-day composite VI generated using the two 8-day composite surface reflectance granules (MxD09A1) in the 16-day period. Also, the reflectance bands were combined to create NDVI vegetation indices by using Landsat ETM+ (path 175, row 34) dataset of August 2015 and August 2016. A set of 12 measures -or channels-were then processed by a temporal Fourier algorithm: Middle infra-red reflectance, daytime LST, night-time LST (MODIS), NDVI (MODIS), EVI (MODIS), NDVI (Landsat), Emis 31 (MODIS), Emis 32 (MODIS), DEM (non-MODIS), number of cattle, ovine and poultry (non-MODIS). Records of the old and new CL cases between the years 2008 and 2016 were obtained from the Ministry of Health, Turkey. These data were used for the verification of the created risk maps. In total, 172 CL cases were reported which were geo-positioned with GIS tools by using ArcMAP 10.0 software. All obtained data were analyzed by using PASW statistical software version 18.0. To determine the relationship between the collected sandfly species vectors and environmental variables, a univariate binary logistic regression analysis was performed. A multivariate analysis was conducted to determine the prediction about the presence of CL cases. The risk map created for P. tobbi and P. perfiliewi in the study area was grouped as high (10) to low (1) in terms of the risk level. The P. neglectus/syriacus risk map was categorized as high (5) to low (4.88). A total of 544 sandflies were caught, and 435 of them were found to be members of the genus Phlebotomus. The P. tobbi was found as dominant species in the study. The densities of vector species were determined according to the altitudinal range. 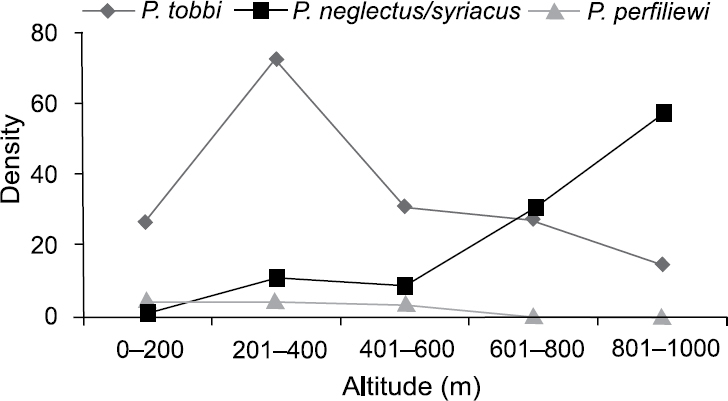 Phlebotomus tobbi and P. neglectus or P. syriacus were present at all altitudes, but were dominant at 201–400 and 801–1000 m respectively. Phlebotomus perfiliewi was not present at all altitudes, it was caught only at 0–200 and 401–600 m [Figure 3]. Figure 3: The density of vector sandfly species according to the altitude in the study area. The results of the univariate binary regression analysis used for determining the relationship of CL presence with various environmental factors are shown in [Table 1]. The probability of the presence of vector sandfly species in each location was observed to be significantly correlated with NDVI (MODIS), EVI (MODIS), MIR (MODIS), DEM (SRTM), NDVI (Landsat), EMIS 31 (MODIS), Emis 32 (MODIS), Daytime LST max–min temperature (MODIS), and Night-time mean LST values [Table 1]. The results of the multivariate analysis are shown in [Table 2]. Presence of three possible vector sandfly species are individually related to one or more parameters. Multivariate analysis results emphasized that both EVI and Emis 31 values are related to the presence of these three-vector species in the study area [Table 2]. The level of CL risk was correlated with several geographical environmental variables. Based on the presence of three-vector species (P. tobbi, P. neglectus/syriacus and P. perfiliewi), the risk value maps, showing the risk levels from low (white) to high (dark) [Figure 4] and [Figure 5], were created taking into account MODIS, non-MODIS, Landsat and SRTM databases. After statistical and geographical analyses, the presence of P. tobbi and P perfiliewi was found to be significantly correlated with the EVI values; in addition, the presence of P. neglectus/syriacus was associated with emissivity [Figure 4] and [Figure 5]. Figure 4: Risk level map of the cutaneous leishmaniasis based on database (EVI) related to P. tobbi and P. perfiliewi. Figure 5: Risk level map of the cutaneous leishmaniasis based on database (EMIS 31) related to P. neglectus/syriacus. For validation of these CL risk maps, location coordinates of 172 CL patients were marked on the risk map. The validation of the model was tested based on number of cases in each risk levels. The number of the CL cases defines the risk levels which were categorized as high, moderate and low as shown in [Figure 6]. The high-level risk group (30.81%) in the study area was determined according to the validation map. The high-level risk group is followed by moderate (66.86%) and low-level risk groups (2.33%), respectively. Figure 6: Validation of risk map based on number of the cutaneous leishmaniasis cases. Geographical information system technologies, commonly used to estimate disease exposure levels at unsampled locations has advanced with years. For example, several modeling approaches that account for spatial correlation have been developed to estimate human exposure to disease agents vectored by different agents/vectors in unsampled regions. 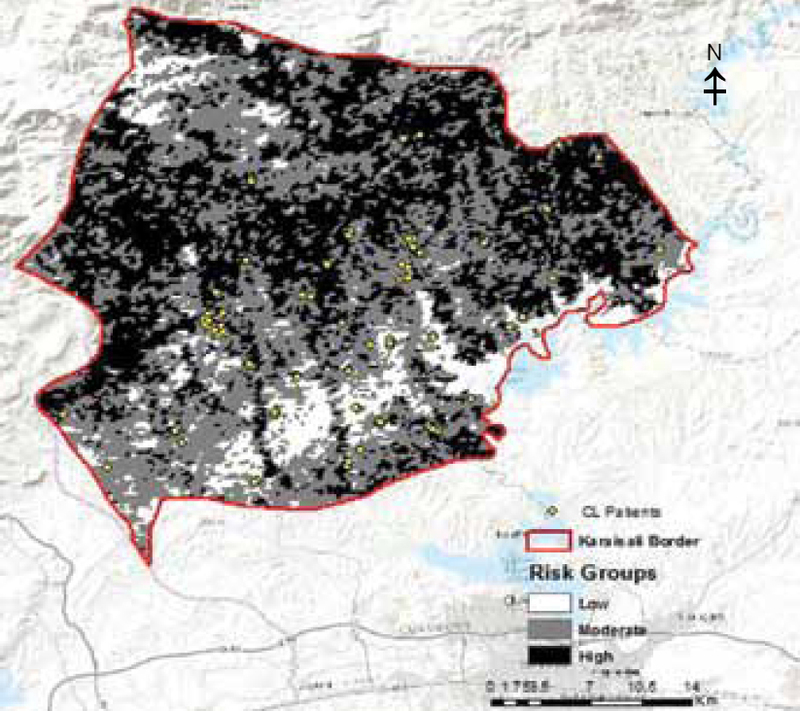 In this study, the CL risk maps generated through GIS technologies highlighted the actual spatial heterogeneity of the CL data, and provided a tool for targeting entomological and epidemiological surveillance and control programmes in risk areas. The available expertise and bibliographic knowledge on the respective vectors and reservoirs of each CL type enabled to create the CL risk maps,,. The distribution and incidence of vector-borne diseases was related to the population of arthropod that has the transmissible role, and the environmental conditions of habitats where the vector is living. Binary and multivariate logistic regression approaches are used to assess the relative importance of environmental parameters with respect to the presence or absence of VL cases in an area. Multivariate and a univariate binary logistic regression analyses are undertaken to determine the predictor variables affecting the presence of ACL, the relationship between vector species, and several geographical variables, respectively,. In the present study, univariate and multivariate binary logistic regression analyses were used to determine the relationship between the presence of vector sandfly species and geographical and non-geographical data, and showing up the effects of factors that cause CL disease. 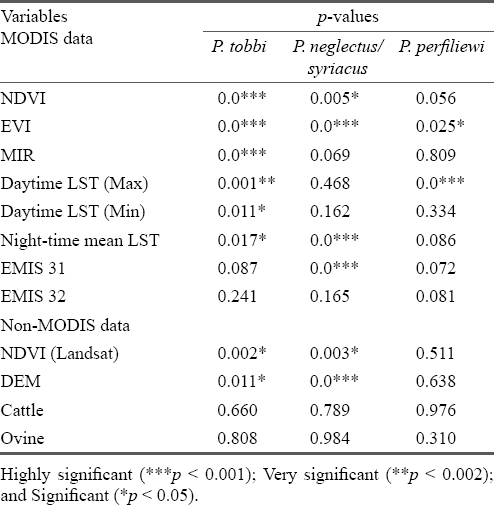 In univariate logistic regression analysis, NDVI, EVI, MIR, DEM, NDVI (Landsat), EMIS 31, Daytime LST max-min temperature and Night-time mean LST values, which were found to be statistically significant (p<0.005), were observed to be significantly related to the distribution of three-vector species [Table 1]. These meaningful variables were also included in multivariate logistic regression analyses. Multivariate analyses showed that EVI and EMIS 31 values were statistically significant for the three species. 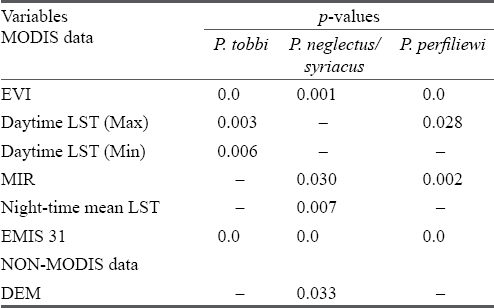 Day-time LST max values were related to P. tobbi and P. perfiliewi and MIR values were significant for P. neglectus/syriacus and P perfiliewi [Table 2]. The model proposed in this study is based on the development of multivariable logistic regression prediction models and spatial modeling techniques by adding previously unused parameters (EMIS 31, EMIS 32, MIR, ovine, cattle and poultry number), different area and vector species. In Aydin province, Turkey, Olgen et al have generated a spatial risk model for cutaneous and visceral leishmaniasis and the vector species distribution. Geographical information of 132 localities (SRTM, NDVI, EVI and LST) were compared with fauna data to evaluate the risk level of the disease. In this study, data of MIR, EMIS 31, EMIS 32 and the number of ovine and cattle were used (in addition to the data used by Olgen et al for determining the effects of geographical factors on the presence of vector sandflies and epidemiology of leishmaniasis. Hence, this study has improvements over the reported study on determining spatial risk factors in the southern part of Turkey. For validation of the risk maps, three risk categories (low, moderate and high) were determined after the correlation between CL cases data and the presence of sandfly species. It was observed that the density of sandfly species is related to the number of patients in the study area. It was confirmed from the validation map, that a high number of CL patients (97.67%) resided/lived in areas that were included in high and moderate risk level groups. The high number of CL cases in areas with high and moderate risk supports the model validation. Limitations to this approach fall into two major categories. First, disease risk or incidence is more closely correlated with the abundance of pathogen-infected vectors rather than with the simply presence of vectors or total abundance of vectors. Second, such studies are mainly correlational, so that the direct causal relationship between environmental factors with presence and abundance of vector species remains to be established,. Present GIS tools and mapping technologies are of great importance in analyzing and mapping the vector-borne diseases. The generated risk maps and cases maps could help health care professionals in planning, managing and controlling the vector-borne diseases like CL in the endemic areas with reasonable solutions. They could be used in surveillance programmes for monitoring of the prevailing diseases, to better understand the distribution of vectors, and determine their epidemiology and risk level. Further, the risk maps generated could be useful in reducing the economic losses in the applications of insecticides in future. The authors thank the Scientific Research Projects Coordination Unit of Cukurova University, Adana, Turkey, which supported the study (Project ID: TSA-2015-3753). Kato I, Uezato H, Katakura K, Calvopina M, Marco JD, Barroso PA, et al. Detection and identification of Leishmania species within naturally infected sandflies in the Andean areas of Ecuador by a polymerase chain reaction. Am J Trop Med Hyg 2005; 72(1): 87–93. New Technical Report Series Report No. 949. Geneva, Switzerland: World Health Organization 2010. Available from: http:// www.who.int/neglected_diseases/integrated_media/integrated_media_2010_leishmaniasis/en/ (Accessed on November 10, 2016). Houin R, Abonnence E, Deniau M. Phle'botomes du Sud de la Turquie. Ann Parasitol Hum Comp 1971; 46:633–52. Ozcel MA, Daldal N. Arthropod diseases and vectors, v 13. Turkey: Turkish Parasitology Association 1997; p. 527. Yaman M, Ozbel Y. The sandflies (Diptera: Psychodidae) in the Turkish province of Hatay: Some possible vectors of the parasites causing human cutaneous leishmaniasis. Ann Trop Med Parasitol 2004; 98(7):741–50. Svobodova M, Alten B, Zidkova L, Dvorak V, Hlavackova J, Myskova J, et al. Cutaneous leishmaniasis caused by Leishmania infantum transmitted by Phlebotomus tobbi. Int J Parasitol 2009; 39:251–6. Kavur H, Eroglu F, Evyapan G, Demirkazik M, Alptekin D, Koltas IS. Entomological survey for sand fly fauna in Imamoglu Province (Cutaneous Leishmaniasis Endemic Region) of Adana, Turkey. J Med Entomol 2015; 52(5):813–8. Ok Z, Balcioglu IC, Ozkan AT, Ozensoy S, Ozbel Y. Leishmaniasis in Turkey. Acta Trop 2002; 84(1):43–8. Ozbel Y, Balcioglu IC, Olgen MK, Simsek FM, Ozensoy Toz S, Ertabaklar H, et al. 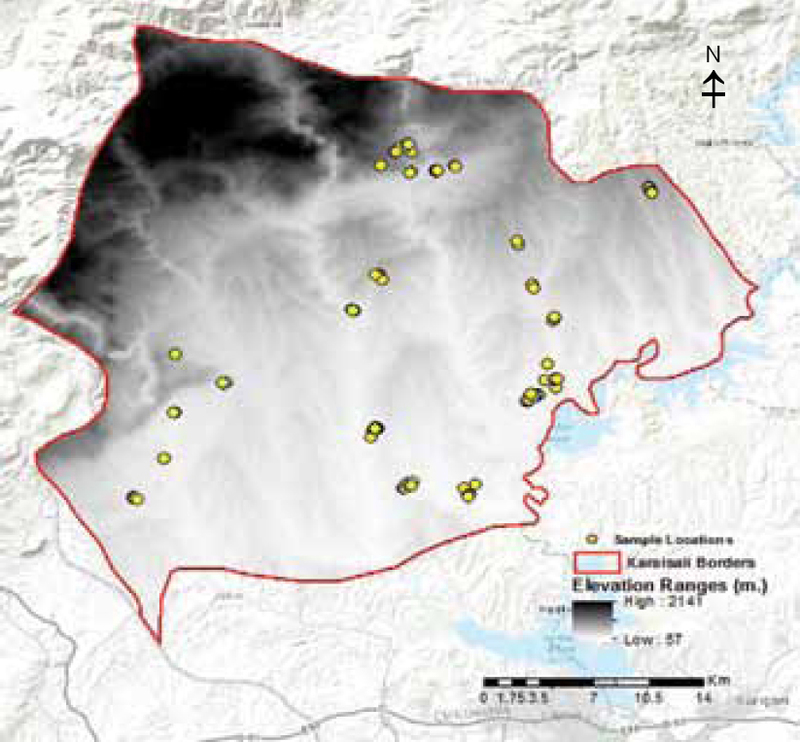 Spatial distribution of phlebotomine sandflies in the Aydin mountains and surroundings: The main focus of cutaneous leishmaniasis in western Turkey. J Vector Ecol 2011; 36:99–105. Momeni M, Saradjian, RM. Evaluating NDVI-based emissivities of MODIS bands 31 and 32 using emissivities derived by Day/Night LST algorithm. Remote Sens Environ 2007; 106(2):190–8. Kahime K, Boussaa S, El Idrissi AL, Nhammi H, Boumezzough A. Epidemiological study on acute cutaneous leishmaniasis in Morocco. J Acute Dis 2016; 5(1):41–5. Ebrahimi S, Bordbar A, Esmaeili Rastaghi AR, Parvizi P. Spatial distribution of sandfly species (Psychodidae: Phlebtominae), ecological niche, and climatic regionalization in zoonotic foci of cutaneous leishmaniasis, southwest of Iran. J Vector Ecol 2016; 41(1):103–13. Ministry of Health Reports 2016. Leishmaniasis data of Adana Province. Ministry of Health, Turkey. Available from: http:// www.thsk.gov.tr/component/k2/353-istatiksel-veriler/zoonotik-ve-vektorel-hastaliklar-daire-baskanligi-istatiksel-verileri.html (Accessed on November 10, 2016). Glass GE. Geographic information systems. In: Nelson KE, Williams CM, editors. Infectious disease epidemiology: Theory and practice. Gaithersburg, MD: Aspen Publishers 2001; p.231–53. Lawson A, Biggeri A, Bohning D, Lesaffre E, Viel JF, Bertollini R. Disease mapping and risk assessment for public health. New Jersey, USA: John Wiley & Sons 1999. Available from: http:// www.euro.who.int/document/e63686.pdf (Accessed on November 10, 2016). Turkish State Meteorological Service Reports 2015. Turkey: Turkish State Meteorological Service, Meteorological Data of Adana Province 2015. Didan K, Munoz AB, Solano R, Huete A. MODIS vegetation index user’s guide. Tucson: The University of Arizona 2015. MOD13Q1: MODIS/Terra vegetation indices 16-day L3 global 250 m SIN grid V006, Washington. Available from: https:// lpdaac.usgs.gov/dataset_discovery (Accessed on January 10, 2017). Olgen MK, Ozbel Y, Balcioglu IC, Demir S, Simsek F, Ozensoy Toz S, et al. A new approach for determining the spatial risk levels for visceral and cutaneous leishmaniasis related with the distribution of vector species in western part of Turkey using geographical information systems and remote sensing. Kafkas Univ Vet Fak Derg 2012; 18: A77–84. Chang AY, Parrales ME, Jimenez J, Sobieszczyk ME, Hammer SM, Copenhaver DJ, et al. Combining Google Earth and GIS mapping technologies in a dengue surveillance system for developing countries. Int J Health Geogr 2009; 8:1–11. Chu HJ, Chan TC, Jao FJ. GIS-aided planning of insecticide spraying to control dengue transmission. Int J Health Geogr 2013; 12:1–9. Ostfeld RS, Glass GE, Keesing F. Spatial epidemiology: An emerging (or re-emerging) discipline. Trend Ecol Evol 2005; 20(6):328–36. Garni R, Tran A, Guis H, Baldet T, Benallal K, Boubidi S, et al. 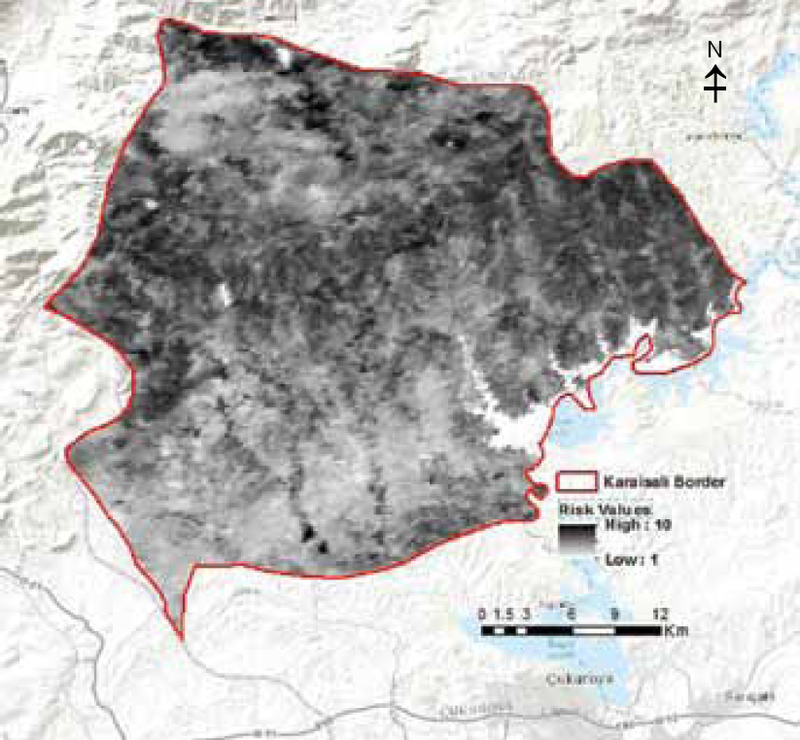 Remote sensing, land cover changes, and vector-borne diseases: Use of high spatial resolution satellite imagery to map the risk of occurrence of cutaneous leishmaniasis in Ghardaïa, Algeria. Infect Genet Evol 2014; 28:725–34. Tsegaw T, Gadisa E, Seid A, Abera A, Teshome A, Mulugeta A, et al. Identification of environmental parameters and risk mapping of visceral leishmaniasis in Ethiopia by using geographical information systems and a statistical approach. Geospat Health 2013; 7(2):299–308.